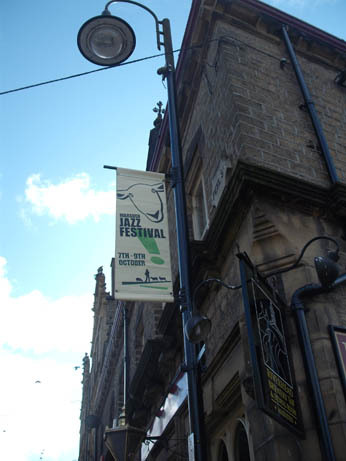 I have had a lovely weekend at the Marsden Jazz Festival, this was my second year helping out and this year I was running the box office. We had a very good time, despite the horizontal rain on Saturday and Sunday but it didn’t dampen enthusiasm, even the street band on the Sunday played on despite the very soggy conditions. The pics of the village here were taken on the Friday when it was lovely and sunny! 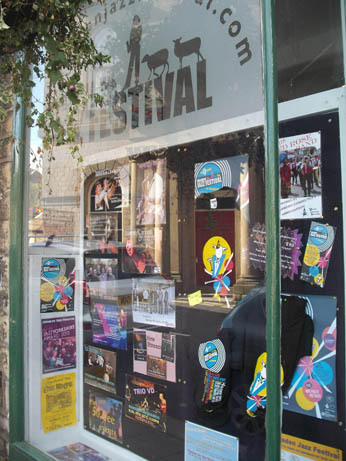 This is the little festival shop with a display of our t-shirts for this year. The festival takes place in all the pubs and clubs in the village and this is one of the banners outside the very nice Riverhead Brewery pub – lots of real ale brewed here plus very nice food. It is also right next to the village river so is a great location, especially when it is nice weather. 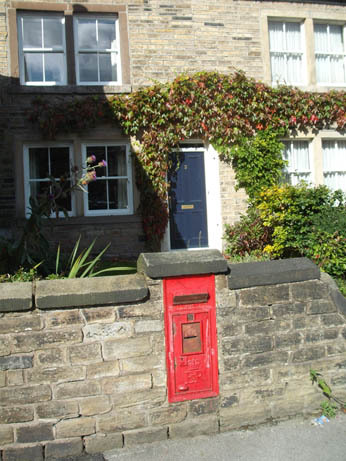 This pic is of one of the very cute cottages in the village, I love the flowers over the door and the disused post box in the wall – very picture postcard! It was very busy so didn’t get the chance to see many of the bands but did get to see a bit of the late night Saturday gig by the wonderful Submotion Orchestra whose CD I have now bought and am listening to as I type this post. They are fab – the vocalist Ruby Woods has the most amazing voice and I am going to see them live again as soon as I can. Really soulful music with excellent lyrics. Go and watch their video at the band’s web site . Not a lot of crafting going on due to the weekend away. I have just got my Autumn Exchange piece so will photograph that to show you next post. Meanwhile hope that you are all well and happy and thanks for visiting.